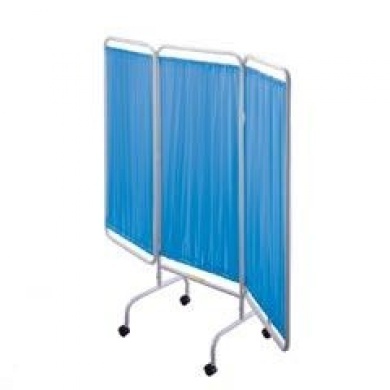 To provide privacy to your patients, we offer stand-alone privacy screens — either with or without casters, as well as wall-mounted telescoping curtains. All made of flame-retardant vinyl panels in choice of several colors. (Our vinyl screening meets minimum requirements of flame resistance of California fire marshall for products identified in section 13115, CA health and safety code, and NFPA# 701). Latest Products Corporation also sells CUBICLE CURTAINS , custom-made to your specifications, in your choice of dozens of different colors and fabrics. Please contact us if you are interested in learning more about this.